White truffle oil adds a touch of elegance to this classic steakhouse side. Put the potatoes in a large saucepan and cover with cold water. Add salt and bring to a boil over high heat. Reduce heat and simmer until potatoes are tender when pierced with a knife, 15 to 20 minutes. Drain and return to pan. Cook potatoes over low heat stirring constantly until the excess moisture evaporates, about 3 minutes. 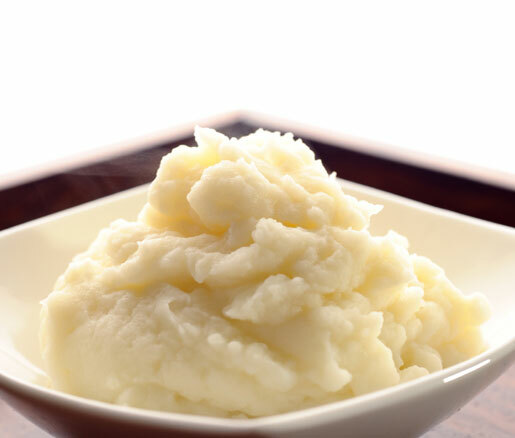 Mash potatoes with a food mill, ricer, or potato masher. Add butter and blend until thoroughly combined. Combine half-and-half with truffle oil in a small saucepan. Heat over medium heat until liquid is warmed, about 3 minutes. Add the mixture to the potatoes slowly, stirring gently, until smooth. Season with salt and pepper to taste and set aside to keep warm.